Established in 1997 ATB Systems is a leading designer and manufacturer of aluminium windows and doors and curtain walling. We have a range of products that address the key challenges of a variety of market sectors including healthcare, mental health, education, leisure, retail, offsite construction, modular buildings, temporary buildings and the commercial sector. From the Taurux Max™ range, Lion Picture Framing chose to use a top hung casement window incorporating an integral anti-vandal mesh and a parallel opening window for their ground floor window for extra security. 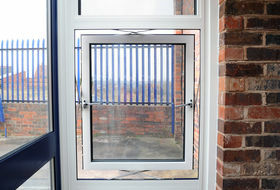 ATB offers a range of security windows, doors and curtain walling. 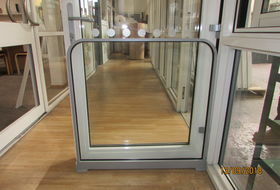 ATB manufactures pedestrian barriers for automatic doors; perfect for commercial applications such as shops, schools, offices and hospitals. 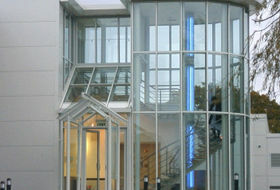 ATB manufactures a range of commercial windows, doors and curtain walling products. ATB has created a range of windows designed specifically to meet the requirements of the education sector. ATB are experts in producing lightweight windows and doors for the outdoor event market. ATB produce aluminium windows and doors designed for modular and offsite construction. ATB produces lightweight aluminium windows and doors for all types of portable buildings & huts. Drawing on our many years of experience A.T.B. aim to satisfy the needs of customers that require quality aluminium windows and doors, combined with excellent personal service and reliable deliveries. ATB works across a wide range of applications including the new build and refurbishment of offices, student accommodation, schools and hospitals supplying external windows, security windows, entrance doors and curtain walling.